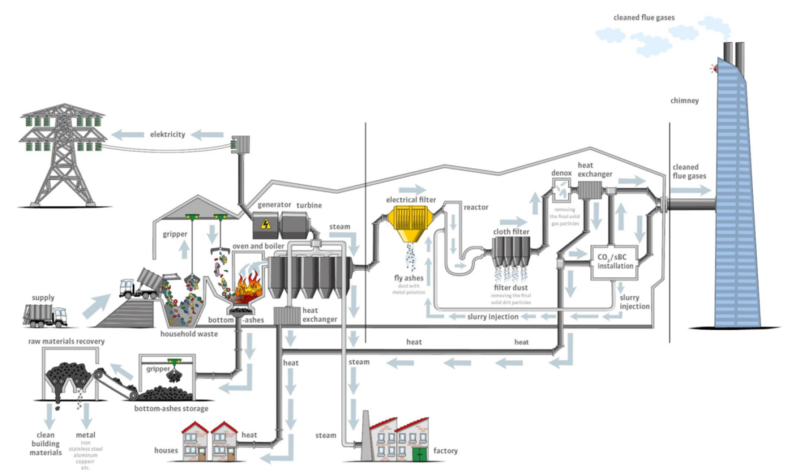 In this project Twence is demonstrating an innovative technology for re-using carbon dioxide (CO2) by capturing the CO2 from the flue gases of the waste to energy (WTE) plant and using it for the production of sodium bicarbonate (NaHCO3) as a result of the alkaline reaction with soda (Na2CO3). The produced sodium bicarbonate will be used at the waste to energy plant for flue gas cleaning purposes (removal of acid components). Twence uses sodiumbicarbonate (NaHCO3) in its WTE-plant for flue gas cleaning purposes (removal of acid components). In collaboration with other parties, Twence developed an innovative system for capturing CO2 from the fluegasses of one of the incineration lines, to use it as raw material for the productionof NaHCO3. It is a small cycle of significant environmental importance. The project is supported by the Provincince of Overijsssel and the Dutch government as well as the European Union. The overall objective of the project is an unique on-site carbon dioxide capture unit as well as a downstream sodium bicarbonate reactor geared to the consumption of this flue gasses cleaning product by Twence. The production capacity of the demo plant is 8,000 tons of sodium bicarbonate on an annual basis. As a result the project has major environmental benefits. For example, the reduction of carbon dioxide consumption as a result of the innovative technology is calculated on more than 3,000 tons on an annual basis. Demonstration of the re-use of the captured carbon dioxide for the on-site production of sodium bicarbonate to be used in the flue gasses cleaning system of the WTE plant. The knowledge we gained by developing this system is highly valuable for ourselves and for others, as we distribute it through a.o conferences and publications. Thus, this pilot plant is a major contribution to the development of successful CO2-capture (and reuse) systems and helps enabling Twence and others to make the next step. Transfer the knowledge gained by developing, building and operating this facility to other parties and projects, to enable industry in Europe (and worldwide) to make the next step (developing, building and successful operating of large scale CO2 Capture & Usage plants).